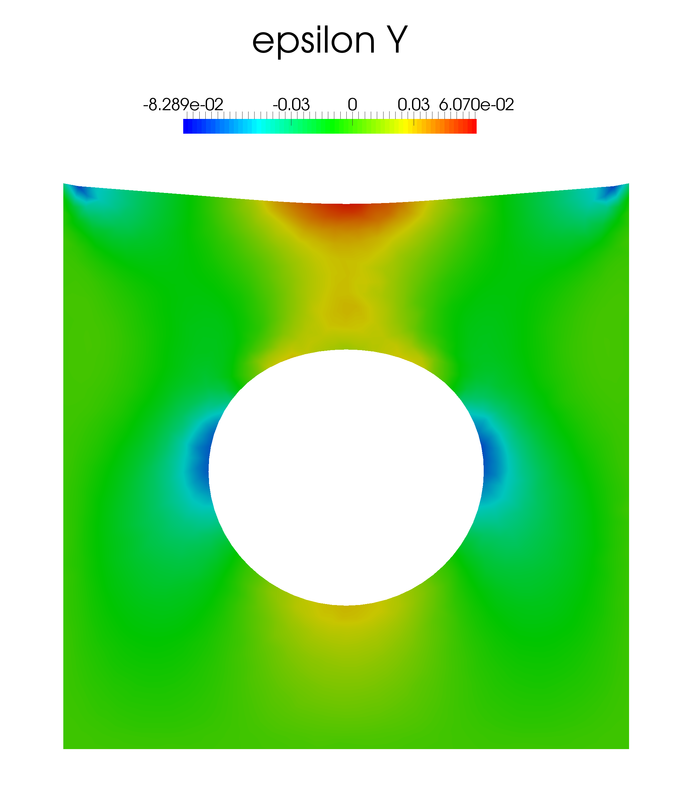 The finite element method is one of the most popular numerical methods, but it encounters difficulties, but it is sensitive to locking and distortion. 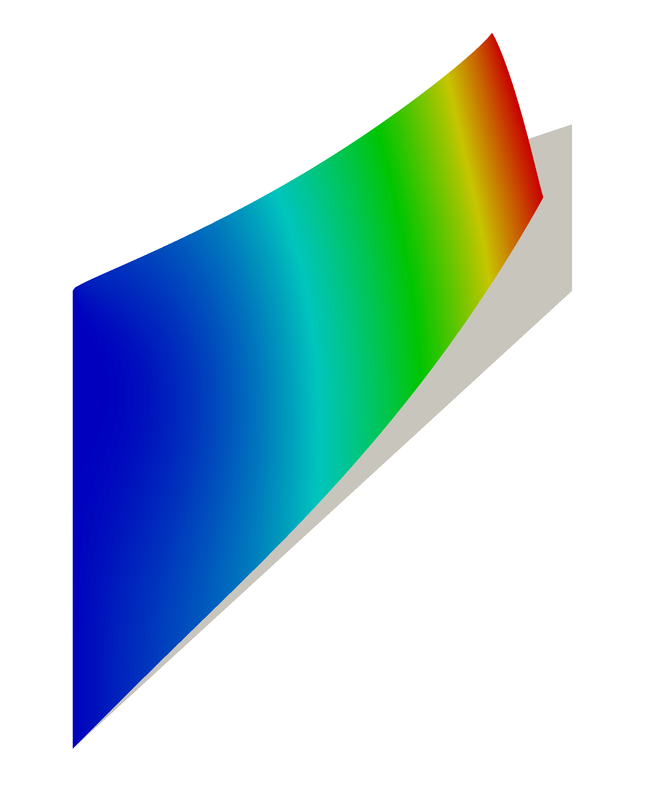 The gradient smoothing technique for finite element approximation (Smoothed Finite Element Method) was developed to alleviate such difficulties of the FEM. This work is the extension of the gradient smoothing for non-linear problems involving large deformations in nearly-incompressible and incompressible hyperelastic materials. The gradient smoothing is to divide the computational domains into sub-domains where strains are smoothed. The strains are constant over the smoothing domains but they are discontinuous across the boundaries of smoothing domains. Ability to deal with mesh distortion. Ability to use the arbitrary shape of element. Poisson’s ratio ν is 0.49999997. We developed a spectrum of gradient smoothing approaches for finite elasticity, we tested them thoroughly on a number of benchmark problems and compared their performance to both the standard finite element method (FEM) and the gold-standard locking-free element: the MINI element. The long-term aim of our research efforts is to enable the use of a wide variety of finite elements, from tetrahedral to polyhedral, which are not subject to locking. In the context of computer-aided surgery, which is one of the central activities of Legato-team, achieving this would allow to simplify and automate the creation of patient-specific meshes. Homogeneous deformations all methods tested are able to reproduce finite homogeneous deformations to machine precision. If the analytical solution lies in the approximation space, smoothed FEM is able to reproduce it to machine precision. Locking most strain smoothing approaches tests are able to alleviate locking. However, the node-based smoothing is the most accurate and can deal with severe incompressibility. Mesh distortion strain smoothing alleviates the deleterious effects of mesh distortion to a large extent. The edge-based smoothing approach is the best-suited for this. Selective smoothing by selectively smoothing the volumetric (using node-based smoothing) and deviatoric (using edge-based smoothing) part of the deformation gradient, a compromise between edge and node-based smoothing can be devised, which shares properties of both. Performance for extremely large deformations we tested the methods up to strains of 25% only. It is necessary to investigate much larger deformations, compatible with those arising in surgical practice. Large scale simulations the largest problems we solved (using MATLAB) contained 20402 degrees of freedom and 500 load steps. This should be pushed further to investigate the behaviour of the method for realistic applications. Complexity, computational cost versus accuracy we did not investigate the algorithmic complexity of the methods proposed and compared them to the best performing competitors (MINI element). This is the subject on on-going work in the team. 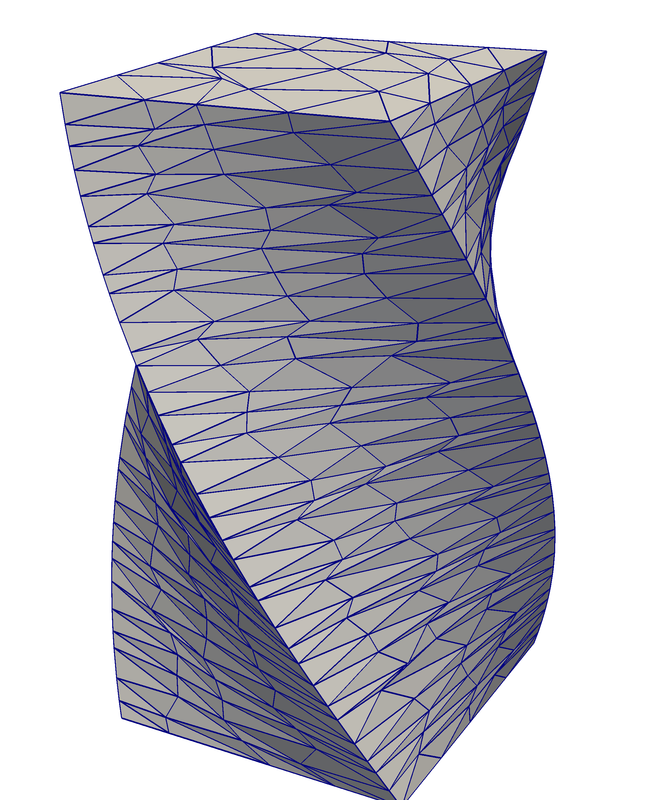 Extension to polyhedral elements perhaps the most promising aspect of strain smoothing is its ability to deal with arbitrary elements. This work was focused on tetrahedral elements. We are now investigating its behaviour for polyhedral elements and comparing this approach to the Virtual Element Method . Extension to higher-order and enriched non-polynomial approximations it was shown in  that higher order polynomial and non-polynomial enriched approximations did not blend well with strain smoothing. We believe this is related to integration [3,4] We will investigate these problems in the context of large deformation finite elasticity. Comparison and coupling with Arbitrary-Lagrangian-Eulerian (ALE) schemes we did not compare our approach to ALE approaches, which is a topic of on-going research in the group. In particular, a coupling of S-FEM and ALE could potentially help reach extreme deformations whilst minimising mesh motion. Parallelisation the node-based SFEM seems well-suited for parallelisation, as all nodes can be treated independently. This could be, in particular, looked at within the context of Graphical Processing Units (GPUs). C.K. Lee, L.A. Mihai, P. Kerfriden and S.P.A. Bordas. Gradient Smoothing for Nearly Incompressible Hyperelasticity. 11th World Congress on Computational Mechanics (WCCM), Barcelona, Spain, 2014. C.K. Lee, L.A. Mihai, P. Kerfriden and S.P.A. Bordas. 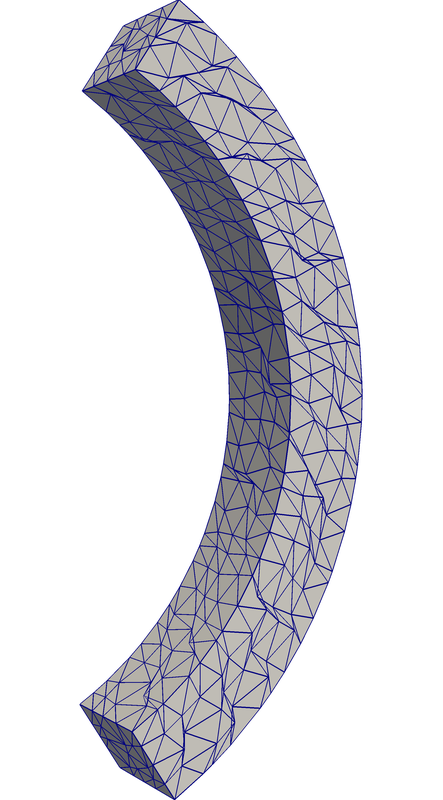 Strain smoothing technique in 3D for nearly incompressible neo-Hookean material, 2014 ( https://orbilu.uni.lu/handle/10993/15705 ). C.K. Lee, L.A. Mihai and S.P.A. Bordas. The Node-Based Smoothed Finite Element Method in nonlinear elasticity, 2013 ( https://orbilu.uni.lu/handle/10993/15391 ). C.K. Lee and S.P.A. Bordas. The simple Shear and Simple Tension Problems in Linear and Nonlinear Elasticity, 2012 ( https://orbilu,uni.lu/handle/10993/15391 ). S. Natarajan, S.P.A. Bordas and E.T. Ooi. On the equivalence between the cell-based smoothed finite element method and the virtual element method. International Journal for Numerical Methods in Engineering, 1-34, 2013. S.P.A. Bordas, S. Natarajan, P. Kerfriden, C.E. Augarde, D.R. Mahapatra, T. Rabczuk and S. Dal Pont. On the performance of strain smoothing for quadratic and enriched finite element approximations (XFEM/GFEM/PUFEM). International Journal for Numerical Methods in Engineering, 86(4-5):637-666, 2011. Q. Duan, X. Li, H. Zhang and T. Belytschko. 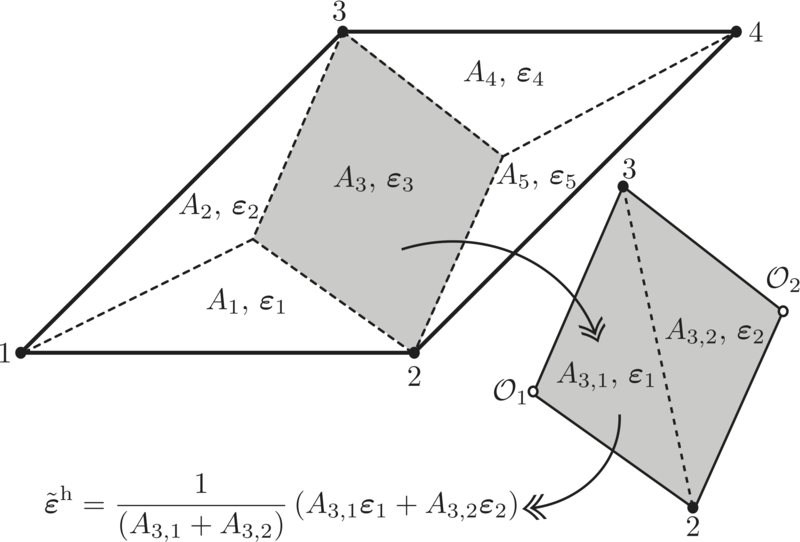 Second-order accurate derivatives and integration schemes for meshfree methods. International Journal for Numerical Methods in Engineering, 92(4):399-424, 2012. A. Ortiz-Bernadin, J.S. Hale and C.J. Cyron. Meshfree volume-averaged nodal projection method for nearly-incompressible elasticity using meshfree and bubble basis functions. Computational Methods in Applied Mechanics and Engineering, 285:427-451, 2015. T.H. Ong, C.E. Heaney, C.K. Lee, G.R. Liu and H. Nguyen-Xuan. On stability, convergence adn accuracy of bES-FEM and bFS-FEM for nearly incompressible elasticity. Computer Methods in Applied Mechanics and Engineering, 285:315-345, 2014. N. Vu-Bac, H. Nguyen-Xuan, L. Chen, C.K. Lee, G. Zi, X. Zhuang, G.R. Liu and T. Rabczuk. 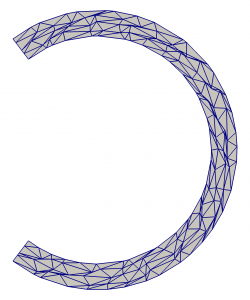 A phantom-node method with edge-based strain smoothing for linear elastic fracture mechanics. Journal of Applied Mathematics, 2013, 2013. C.K. Lee, L.A. Mihai, P. Kerfriden and S.P.A. Bordas. Gradient Smoothing for Nearly Incompressible Hyperelasticity. SIAM Day Cardiff, 2014. C.K. Lee, L.A. Mihai, J.S. Hale, P. Kerfriden and S.P.A. Bordas. Strain smoothing for compressible and nearly-incompressible finite elasticity (in preparation). C.K. Lee. Gradient Smoothing in Finite Elasticity: near-incompressibility, 2015 (PhD thesis: submitted).